Cole Johnson recently graduated from RIT's new bachelor's degree program in human centered-computing and now has a job with Two Bulls in New York City. The new program mixes computing, design and psychology. Cole Johnson’s two favorite things are people and tech. With the help of a new major at Rochester Institute of Technology, he figured out a way to mix the two and got a job doing it. In spring 2018, Johnson became the first student to graduate with RIT’s new bachelor’s degree in human-centered computing (HCC). Now, he is making sure that new technologies meet the needs of consumers as a designer with Two Bulls, a digital product company in Brooklyn. RIT’s new four-year human-centered computing program combines the study of computing, design and psychology to help undergraduates advance the way that people interact with modern technology. The program focuses on the human-computer relationship and includes elements from the human-computer interaction (HCI) field and user experience—also known as UX. Steve Zilora, a professor and chair of the Department of Information Sciences and Technologies in RIT’s B. Thomas Golisano College of Computing and Information Sciences, said that RIT created the interdisciplinary program to fill a need in the industry. Johnson chose to switch into the new HCC major because he liked thinking more about the people using the software he was developing than just the software itself. Zilora said that students with this degree will know how everything works in the initial phases of the software development lifecycle—from gathering and requirements up to the prototyping and usability stages. However, their focus will be on the big picture and how to make technology work for people. In addition to building software, these students will conduct scientific research and user testing. Working with real users, RIT students can develop apps that make American Sign Language more accessible on the computer and Internet-connected devices that help children with autism. “Human-centered computing majors are finding ways to integrate technology with our everyday lives—regardless of our physical capabilities, age, location or socioeconomic status,” said Zilora. 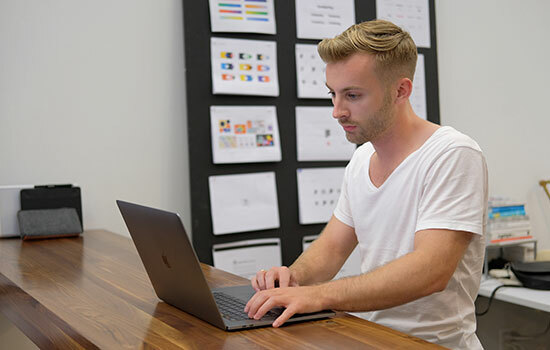 While earning the degree, students can choose to concentrate in specific areas, including accessibility, design, front-end development, psychology, instructional technology and natural language processing. RIT is welcoming its first freshman class of human-centered computing majors this fall, in addition to several transfer students. RIT also offers a master’s degree in human-computer interaction. To learn more about the HCC undergraduate major, go to hcc.rit.edu.